LA JOLLA, CA–New research from scientists at the La Jolla Institute For Allergy and Immunology shows how a diet high in fat and cholesterol depletes the ranks of artery-protecting immune cells, turning them into promoters of inflammation, which exacerbate atherosclerotic plaque buildup that occurs in cardiovascular disease. The team has also found that high density lipoproteins (HDL)–more commonly known as "good cholesterol"–counteract this process, helping the protective immune cells maintain their identity and keep arteries clear. The study published March 15, 2018, in the journal Nature Communications was led by LJI scientists Dalia Gaddis, Ph.D., and Catherine Hedrick, Ph.D.
Inflammation is a key contributor to the hardening and narrowing of the arteries known as atherosclerosis–a condition that can lead to heart attack or stroke. Hedrick's lab is investigating the roles that immune cells play in this process and how the function of different immune cells can change as atherosclerosis progresses. "People think atherosclerosis is just about cholesterol, diet, and exercise, but it's actually an immune disease," says Dalia Gaddis, Ph.D., a postdoctoral researcher in Hedrick's lab. "The blockage of arteries is very much due to the immune system reacting to excess cholesterol and lipids in the walls of blood vessels." Different subsets of immune cells have opposing roles in atherosclerosis–some contribute to the build-up of plaques, and others protect against it, Gaddis explains. In the current study, she and her colleagues focused on protective cells called regulatory T cells, or Tregs. Tregs prevent the development of atherosclerosis. But researchers have found that when mice are fed a high-fat, high-cholesterol diet–also known as a Western diet–their numbers of protective Tregs decline. Gaddis wanted to track regulatory T cells in the mice during this process to find out what was happening to them. Typically, scientists look for a protein called Foxp3 to identify regulatory T cells, but this marker is lost when the cells are reprogrammed into another cell type. So Gaddis used mice in which regulatory T cells would be tagged with two fluorescent markers. One, a yellow marker on the Foxp3 protein, allowed her to easily recognize all regulatory T cells. The second tag–a red one–would also be produced by regulatory T cells and then retained regardless of their fate, enabling the researcher team to track the cells in the blood vessels and atherosclerotic plaques even if they changed their identity and stopped making Foxp3. To begin her experiments, Gaddis fed some of the mice a western diet. After 15 weeks of this regime, she examined the animals' immune cells. The differences were clear. Gaddis found regulatory T cells in the aorta–the large artery that carries blood from the heart to the rest of the body–in all of the mice. But in the animals that had consumed the Western diet, she also saw significant numbers of "ex Tregs" in the lymph nodes and aorta. Molecular analyses revealed that some of the former regulatory T cells had become follicular helper T cells (Tfh). These are critical components of the immune system that help the body fight off viral and bacterial infections. Little was known, however, about how they impact atherosclerosis. 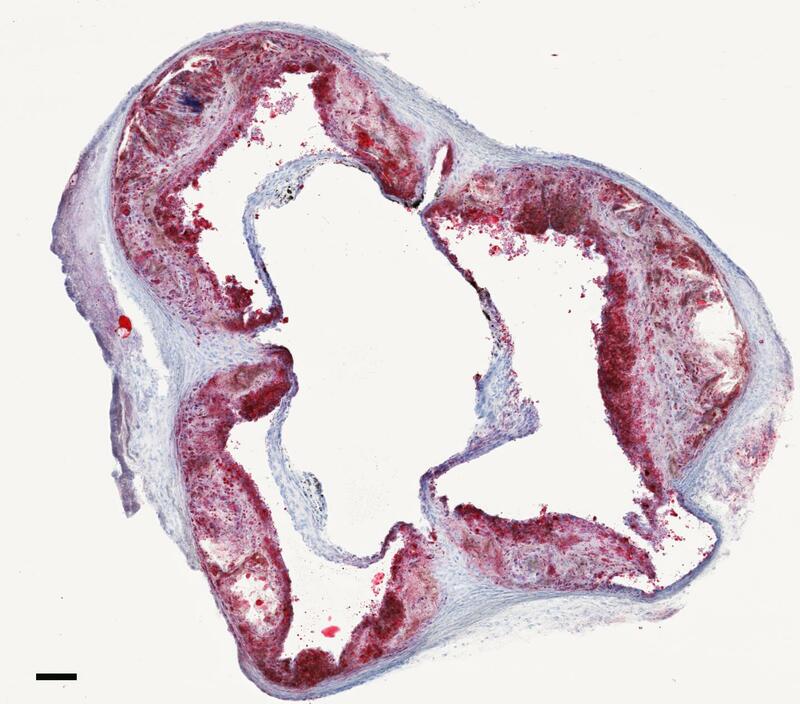 With further experiments, Gaddis and her colleagues established that Tfh cells promote atherosclerosis. By blocking the generation of Tfh cells, the scientists could reduce the development of plaques in the arteries of mice fed the Western diet. The team next wanted to know whether HDL, which removes excess cholesterol from cells, might protect against atherosclerosis by preventing the loss of regulatory T cells. They tested this idea by administering the primary component of HDL, a protein called apolipoprotein AI, to their mice. With this treatment, regulatory T cells resisted the effects of the Western diet and did not change into Tfh cells. Although it's not yet known whether regulatory T cells undergo the same conversion in humans, the finding gives a clearer picture of how diet and the immune system interact to shape cardiovascular risk. "With a western diet, protective cells change to damaging cells, causing more inflammation," says Gaddis. "What we're finding is that HDL–the good cholesterol–actually helps shield the protective cells against the damaging changes that occur during atherosclerosis plaque development." The work was supported by La Jolla Institute for Allergy and Immunology, the American Heart Association (13POST16990031 and 14GRNT20500029), the American Diabetes Association (#712MN13), the National Institutes of Health (P01 HL055798, HL136275, HL118765 HL112276, HL127649, AI089624, AI072543, AI125279, and S10 RR02736601A1). Dalia E. Gaddis, Lindsey E. Padgett, Runpei Wu, Chantel McSkimming, Veronica Romines, Angela M. Taylor, Coleen A. McNamara, Mitchell Kronenberg, Shane Crotty, Michael J. Thomas, Mary G. SorciThomas, Catherine C. Hedrick. Apolipoprotein AI prevents regulatory to follicular helper T cell switching during atherosclerosis. Nature Communications, 2018.